Russian Foreign Minister Sergey Lavrov and U.S. Secretary of State John Kerry today discussed ways of organizing a political process between Assad’s government and the opposition to end the country’s civil war, now in its fifth year. The telephone conversation between the two was a follow-up to their face-to-face meeting in Vienna yesterday, and is a sign of fast moving developments to start a political process. A P5+1-type body, comprising regional actors like Iran, Saudi Arabia and Turkey, and UNSC permanent members like the U.S. and Russia, could be formed to facilitate a political settlement. Meanwhile, Lavrov said today that Russia was ready to support the Free Syrian Army, the main coalition of moderate opposition to Assad, in its fight against the Islamic State. 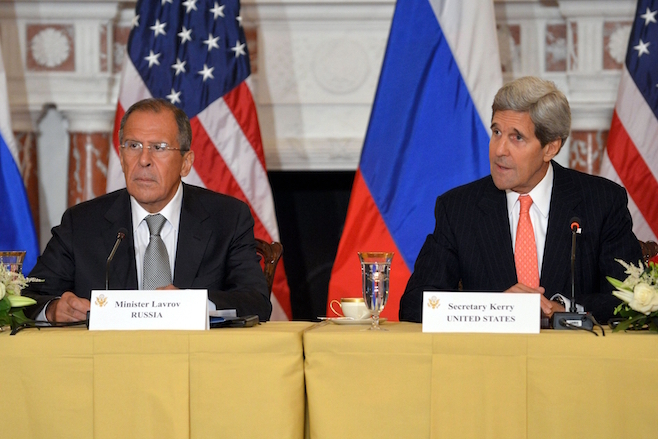 Certain armed elements inside Syria have publicly rejected peace negotiations today. And altho` russia said it would in theory be willing to talk to the fsa and other moderates it had also said that it had not been able to make contact with any of them.The russian policy is pretty clear,anyone who continues to fight the government is a terrorist and will be targeted,and altho the russians have said that they in theory would provide military assistance to groups like the fsa if they would be willing to fight the islamists in practice its very unlikely any of these groups will take the russians up on their offer as this would mean that they are now fighting on behalf of the government against some of their former allies like al nusra,expending men and resources and potentially fatally weakening themselves both militarily and politically.If the syrian war was the internet this would be a russian example of "trolling"
if the Assads are willing to leave Syria and re-locate to Qum or Birobidzhan it would make a political settlement closer to hand. This is what everybody said of Libya only for the rats to turn upon themselves after Gaddafis death.Assad is the bridge for Syria 's past and future !!. Gaddafi's death was in the interest of justice. He may have indeed been all of those things. But ask yourself this, is Lybia better off now as a failed state in a civil war? There is no security, no economy no government. A century of dictatorship is better than a year of chaos and anarchy.